VT Halter Marine, Inc. (VT Halter Marine), a company of Vision Technologies Systems, Inc (VT Systems), yesterday announced the successful launch of the Virginia Department of Transportation’s (VDOT) newest ferry, the Powhatan. 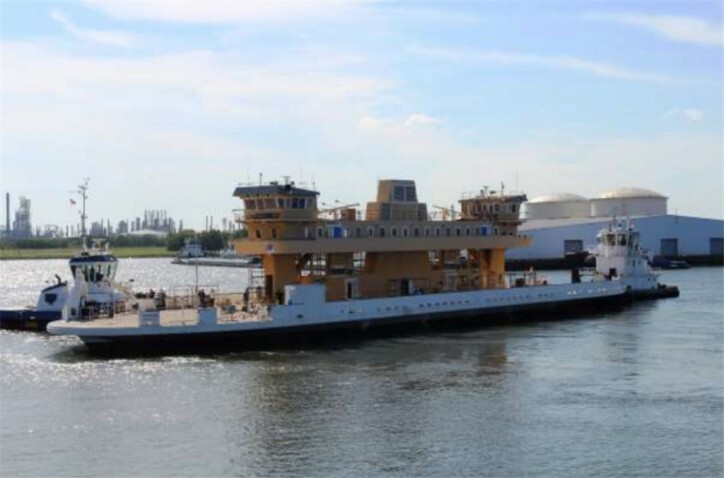 In November 2016, VT Halter Marine was awarded the contract for the design, construction and delivery of the new 499-passenger/70-vehicles ferry that will replace the current vessel, the Virginia, which was built in 1936. Measuring 270ft x 65ft x 15ft, the Powhatan is capable of holding up to 70 passenger vehicles, or 14 trucks/busses, and carrying up to 499 passengers, of which 150 can be accommodated in the Passenger Cabin on the Upper Deck. The Powhatan is designed and certified according to ABS Rules for Building and Classing Steel Vessels for Service on Rivers and Intracoastal Waterways, US 46 CFR, Subchapter H, Passenger Vessels. It has also met the accessibility requirements of the Proposed Accessibility Guidelines for Passenger Vessels, United States Access Board. The ferry will be operated by the Jamestown-Scotland Ferry Service at Scotland Wharf in Surry County, Va. The Jamestown-Scotland Ferry System currently operates four ferry boats, including the Pocahontas, which was also designed and constructed by VT Halter Marine, and delivered in 1995.